Ready to see if epoxy flooring really lives up to all of the benefits you have heard? Our epoxy flooring contractors in Boise, Idaho serve residential and commercial customers with 100% solids epoxy floor systems that are formulated to withstand even the most demanding environments. 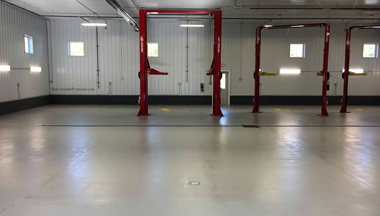 We install epoxy flooring in garages, basements, commercial kitchens, shopping centers, hospitals, office buildings, schools, hotels, and much more. Our concrete epoxy contractors stand behind the work they do with a dedication to great customer service and beautiful flooring that surpasses your expectations. We use a special multi-stage approach to achieve flawless and long-lasting epoxy results. It all begins with careful preparation of your concrete substrate. Our garage floor epoxy contractors will repair all cracks and damage in your concrete first to ensure smooth results with strong bonding. Shot blasting or diamond grinding may be used to remove surface irregularities and profile the surface of the concrete to help the epoxy resin bond. 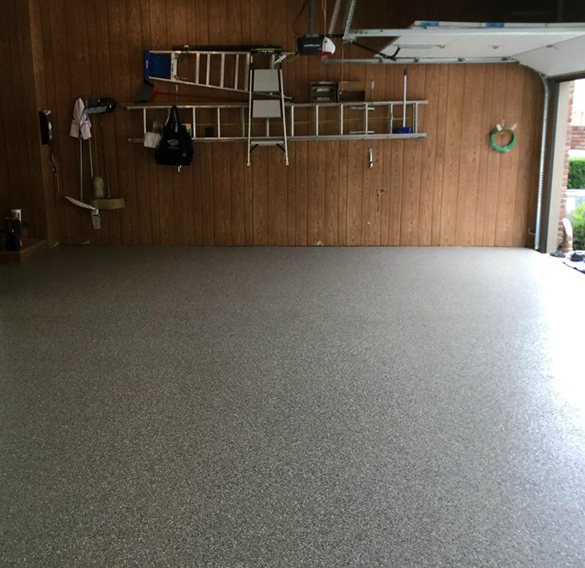 If you have a previous paint, coating, or sealant on your concrete, it will need to be removed with shot blasting before garage epoxy can be installed. Our contractors will also check if there is any dampness coming up through the concrete floor. Depending on the moisture and humidity, a water mitigation system may be required. We begin by assessing your floor for moisture problems to determine if a moisture barrier is needed. We repair all forms of damage to your concrete that can interfere with the epoxy bond, including spalling, crumbling, holes, and cracks. The next step is crucial: we profile the concrete and remove surface imperfections with shot blasting or diamond grinding. This leaves the concrete perfectly smooth and ready for an epoxy coating that will be seamless and durable. Our epoxy coating contractors in Boise use only high-grade 100% solids epoxy to deliver the results you expect. We don’t cut corners when it comes to using the best brands for epoxy flooring that can last up to 20 years without premature failure, stains, delamination, and other issues. 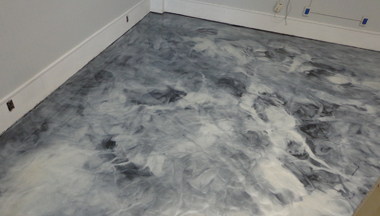 Our epoxy flooring contractors in Boise have spent years perfecting epoxy installation. We can do it all from single colors and simple patterns to stunning metallic epoxy flooring that creates a perfect 3D illusion. Don’t trust a custom epoxy floor to just anyone! Flake epoxy flooring is a popular choice for residential and commercial epoxy flooring. It’s used in hospitals, hotels, stores, and more thanks to its durability, slip-resistant texture, and attractive color choices. Want to add a little color and design to your flooring without sacrificing durability? Our epoxy coating contractors can create the look of granite with flake epoxy. Want a real “wow” factor for your garage, basement, or business? Nothing compares to the elegance of a metallic epoxy floor. 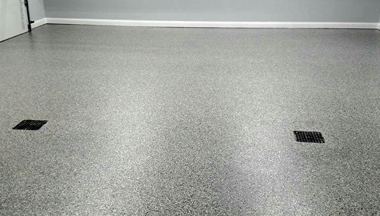 Metallic epoxy is achieved with metallic pigments that our epoxy contractors agitate into swirls and clumps. This creates a realistic illusion of depth and movement. Our Boise epoxy flooring contractors have years of experience and training creating all types of effects like marble, leather, water, molten metal, and more. Quartz epoxy flooring is the perfect way to combine beauty and durability. Our industrial epoxy floor coating contractors install 100% solids epoxy combined with decorative quartz sand that adds texture and increased durability to the floor. 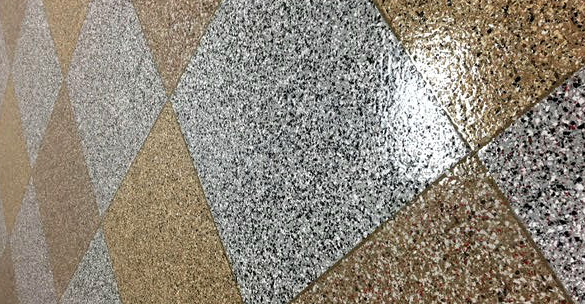 Quartz epoxy can deliver a monochromatic or mosaic look suitable for public areas with the resilience to withstand demanding environments. One of the most popular design options for epoxy flooring is the classic checkerboard pattern. It’s a versatile look that can work in a garage, basement, or commercial property. Our epoxy floor coating contractors can create any type of checkerboard or tile look from the classic black and white tile to something more unique like metallic checkerboard. We can even give you the look of marble or granite tile complete with grout lines. Have something different in mind? Our Boise epoxy contractors look forward to bringing your vision to life with crisp, durable epoxy flooring. We can add business or team logos, transform a garage or sports bar floor into an end zone, create the look of granite tile flooring, and much more. There’s no end to your options with limitless colors, effects, and designs available. Epoxy Flooring Boise is a top-tier professional epoxy flooring company. We believe in nothing but quality and great results which is why we have been voted as the number one epoxy flooring company in Boise, Idaho for many years. We are a third party referral company, all referrals are forwarded to a Epoxy Flooring Boise.